The MBF-P05LM Gundam Astray Mirage Frame is a mobile suit developed by the mysterious organization known as Librarian Works and appeared in the photo series Mobile Suit Gundam SEED VS Astray. A modified version of the MBF-P05 Gundam Astray Unit 5, it is piloted by a Carbon Human copy of Rondo Ghina Sahaku. The "LM" in its model number stands for "Librarian Mirage". The Gundam Astray Mirage Frame is a strengthened and redesigned MBF-P05 Gundam Astray Unit 5, the fifth prototype Gundam Astray that was thought to be lost during the collapse of Heliopolis. 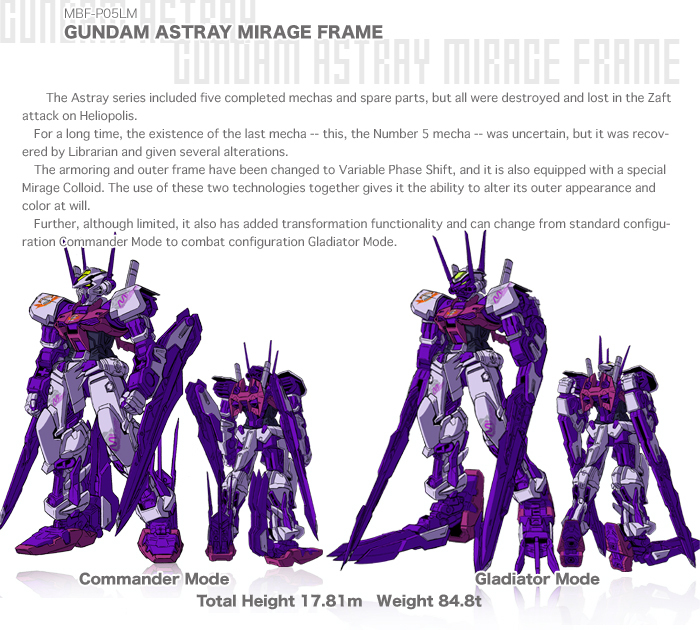 Unlike the other four prototype Gundam Astrays, the Mirage Frame is equipped with Variable Phase Shift (VPS) armor instead of foaming metal armor and it is also applied to the exposed frame. This VPS armor can be utilized alongside a special Mirage Colloid system to alter the suit's appearance. For example, Gina used this ability to disguise the Mirage Frame as MBF-P01 Gundam Astray Gold Frame. The Mirage Frame specializes in close combat and incorporated combat data that the Librarian Works collected on the MBF-P03third Gundam Astray Blue Frame Third. It is armed with the "Amenohabakiri" katana that is similar to the "Gerbera Straight" katana of the MBF-P02 Gundam Astray Red Frame but has VPS technology applied to it, triple blades called A Swords on its feet, beam-cannon equipped large blades known as B Swords on its forearms, and the same "Igelstellung" 75mm multi-barrel CIWS and beam sabers as the other prototype Gundam Astrays. It can also optionally use the prototype Gundam Astray's beam rifle and shield, but they are rarely equipped. The main feature of the Mirage Frame is its transformation mechanism, which although limited, is said to be the fastest among all transformable MS. While it usually appears in Commander mode, the Mirage Frame can switch to Gladiator Mode, its close combat form, by turning around its head which has a pair of melee-combat sensors at the rear, and rotating and folding its forearms and feet to fully deploy the A Swords and B Swords. Lastly, like the other prototype Gundam Astrays, Mirage Frame's backpack can be lowered to the back skirt armor, allowing the mounting of additional equipment on its back. Mounted in the Mirage Frame's head are two "Igelstellung" 75mm multi-barrel CIWS guns. These light projectile weapons are classified as Anti-Air, and can be used to intercept missiles, destroy lightly armored vehicles, etc. Only usable in "Commander Mode". Mirage Frame is equipped with two beam sabers stored on its backpack. Mainly used when in "Commander Mode", they serve as throwing weapons as the suit already has various close combat weaponry. A sword developed using the data of other mobile suit-use katana like the Red Frame's "Gerbera Straight" as well as the "Tiger Pierce", it thus has the same shape as the two aforementioned weapons. Named after a sword of the same name that appeared in Japanese mythology, it incorporates VPS technology that allows it to change its toughness and colors. It also features data-gathering abilities, which are activated upon physical contact with an object. Information gathered upon impact with an object will directly affect the settings of the VPS, which will then be adjusted to guarantee a lethal blow with the next strike. Full name - Anklet Sword, it is a set of three blades mounted on each foot. Mainly used when Mirage Frame is in "Gladiator Mode", but also usable in "Commander Mode". When deployed, the A Swords also serve to increase the suit's stability during movements and close combat. Full name - Bracelet Sword, it is a large blade mounted on each forearm and has a built-in beam cannon in its tip. The B Swords are designed to counter the Sword Arms of the MBF-P03R Astray Blue Frame 2nd Revise's Tactical Arms II. Mainly used when Mirage Frame is in "Gladiator Mode", but also usable in "Commander Mode". The same ranged beam weapon as used by the other prototype Gundam Astrays. It fires an energy beam that is highly effective against most targets, such as mobile suits, but is less effective against targets designed to take beam attacks, such as laminated armor or shields treated with an anti-beam coating. The rifle can be used only in "Commander Mode" and is rarely equipped due to Mirage Frame's specialization in close combat. The same shield as used by the other prototype Gundam Astrays for defense. However, to keep the Mirage Frame mobile and agile for close combat, this shield is rarely equipped. A connector for attaching additional equipment to the back of the suit. It is similar in function to the hardpoint on the back of the Strike Gundam. The connector is exposed when the backpack is lowered to the back skirt armor. Close-range sensors in the back of the head, they are used only when the suit is in Gladiator Mode. The melee-combat sensors sacrifice long-range data gathering ability in exchange for optimum efficiency in close-range. Since using the sensors will cause a significant decrease in sensing radius, it is rarely used if the Mirage Frame is not partnered with a MS capable of protecting it from range attacks (usually the Hail Buster). While the single antenna at the front of the head is for communications, the two antennas at the rear serve special function. Usable only in Gladiator Mode, they can spread mirage colloid particles around the suit and through them sense the movement of enemy units nearby, even those that are cloaked can be detected. Unlike the mirage colloid system that is used by other mobile suits, the system used here is not for cloaking but used in conjunction with the VPS armor to alter the appearance of the suit, allowing it to disguise itself as other mobile suits. In CE 71, the Orb Union's Morgenroete corporation built five Gundam Astray prototype mobile suits at Heliopolis, the MBF-P01 Astray Gold Frame, MBF-P02 Astray Red Frame, MBF-P03 Astray Blue Frame, MBF-P04 Astray Green Frame and MBF-P05 Gundam Astray Unit 5, which were based on the five G Project Gundams that they assisted the Earth Alliance's Atlantic Federation in creating. They successfully copied the EA's beam rifle and saber technology, but Morgenroete did not have access to the Phase Shift armor design, and compensated this by making the Gundam Astray units lighter and more agile than their EA counterparts. On January 25, CE 71, ZAFT's attack on Heliopolis to steal the Alliance Gundams also unknowingly interrupted the Astray Project. In order hide their progress, Orb's officials decided to destroy the Astray lab. However all Astray prototypes survived and fell into the hands of different factions. MBF-P05, which was not yet assembled, fell into the hands of the mysterious organization Librarian, who modified it into the existing model. With the rebirth of Rondo Ghina Sahaku by Librarian, this mobile suit was assigned to him. Later, the Mirage Frame is damaged in battle with Gai's MBF-P03R Astray Blue Frame 2nd Revise and the Mirage Frame is significantly upgraded to the MBF-P05LM2 Astray Mirage Frame 2nd Issue. The suit's name is probably a reference to the suit uses of mirage colloid and its ability to disguise as other MS.